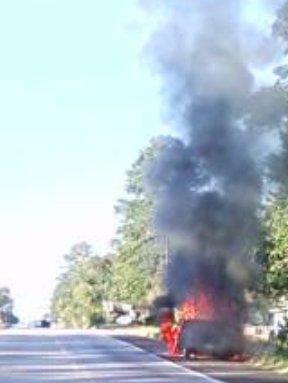 This cell phone picture shows the vehicle enfulfed in flames. Vehicle Fire on 59 North, LEGGETT, October 1, 2008 - A approximately 5:45 pm on October 1, 2008, a blue 1999 Chevy S-10 driven by Alex Adams, 24, of Corrigan, was north-bound US-59 when according to Adams, the vehicle's engine shut off. Adams stated that he coasted off the road to the right side of the road on the north-bound side and stopped his truck. Adams further stated that the truck had smoke coming from under the hood, and soon fire. Adams immediately called 911 and Lieutenant Randy Bridges with the Polk County Sheriff's Office was dispatched to the scene, followed by Deputy Keith Franklin and Livingston Fire Chief Corky Cochran. 2 fire engines from the Livingston Volunteer Fire Department arrived with a handful of firemen and proceeded to put out the flames that now fully engulfed Adams' truck. Within minutes the fire was put out. Two lanes of traffic was re-routed to the center median as the accident was being cleared. Fortunately, nobody was injured in the mishap. Adams had insurance on the truck and no ciatations were issued. The highway was opened back up and traffic fully flowing by 6:20 pm.